An anonymous phoned-in threat had prompted police to evacuate a Turkish Airlines flight bound for Istanbul. The authorities herded the passengers into an airport waiting room and checked hand luggage for explosives. Turkish Airlines flight 1672 received the all clear from Federal Police at 13:45 local time (1145 UTC) on Thursday, enabling the Istanbul-bound plane able to depart the Konrad Adenauer Cologne/Bonn airport after having been delayed by an anonymous phone threat. The police announced on Twitter that their security response had ended. Authorities did not provide any additional information about the origins of the call or what the anonymous threat entailed. However, police confirmed to DW that,"From the telephone call, it was clear the caller was targeting a Turkish Airlines flight." The flight was originally scheduled to depart the airport in northwest Germany at 10 a.m. (0800 UTC) on Thursday, but a phoned-in threat from an unknown caller forced airport officials to issue an emergency stop to the flight that had already rolled onto the takeoff tarmac. All the flight's 111 evacuated passengers were ushered off the plane and into a waiting room inside the terminal while police conducted a comprehensive search of the aircraft using bomb-sniffing dogs. German media reported that explosive experts also closely examined one piece of hand luggage that a dog had signaled could contain explosive material. However, no suspicious material was found. The Federal Police said no other flights had been disrupted during the operation. In June 2017, the region's police detained three British nationals after the men were reportedly overheard having a terrorism-related discussion on an EasyJet flight bound for London. The pilot made an emergency landing at the Cologne/Bonn airport. No suspicious material was found. 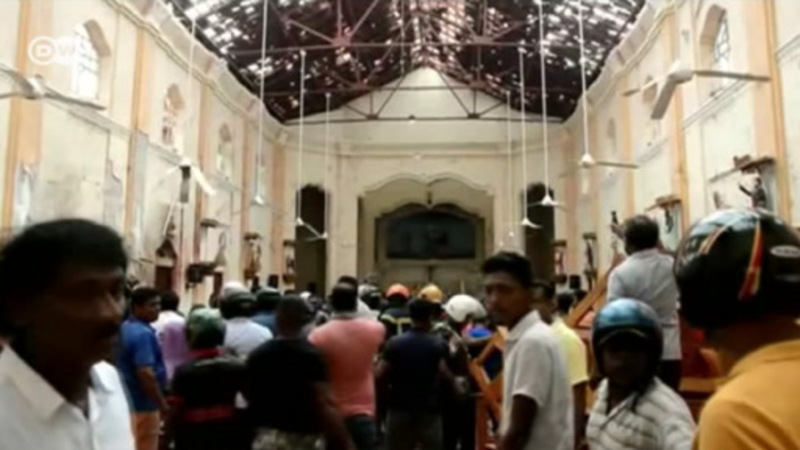 Sri Lanka is reeling from the worst spate of violence since its civil war ended a decade ago. A series of bomb attacks on Sunday at hotels and churches across the country killed hundreds and injured many more.